Thanks to Twitter and Patrick Kremer’s article, I caught the recent news that starting 10 March 2014, VMware will require VCPs to recertify every 2 years to keep their certification current. You can read VMware’s release here. I took the time to read the comment threads on Patricks’ and other’s blogs to get an idea of folks’ reactions. Since you asked, here are my thoughts on the subject. 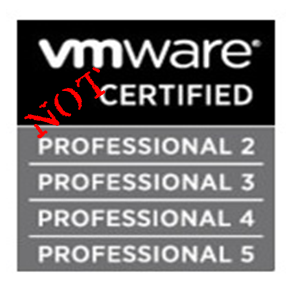 I shouldn’t have to say that it’s obviously VMware’s prerogative to change or create new policies regarding their certification programs. This shouldn’t be a topic of conversation. I was graciously given the opportunity to read and review vSphere High Performance Cookbook, written by Prasenjit Sarkar (@stretchcloud) and published by Packt Publishing, whose subtitle states it has Over 60 recipes to help you improve vSphere performance and solve problems before they arise. Gulping down its chapters was easy after seeing that Prasenjit’s recipes included fixes for such common, and some not so common, misconfigurations or lack thereof. It depends on if the customer has the budget for more Windows or SQL licenses. Does the customer have the compute and disk resources for several more servers? Is there already an existing SQL box or cluster that could be used? Is a DBA on staff, or at least a competent Windows Server admin? Does the customer’s environment even need a full blown SQL installation or would SQL Express do fine? Now I’m coming from a background of government contracting where money is usually thrown at such projects. Resources for such an implementation are little thought about because they’re going to be there no matter what. This question could impact SMBs more, but probably not large corporations. I think there are certainly right and wrong ways to implement based on circumstances. On the one hand, if you have the licenses, compute, disk, and administrative resources, I say absolutely, put each service on it’s own separate box. In more constrained environments, you may need to double up two or more services. That’s not the least of it. Recovering from a failed VM will cost you less in time, effort, and hopefully, money. With an “all your eggs in one basket” approach, if one VM goes down, is somehow unrecoverable, then you’ve lost a lot of data. Separating your services reduces the liklihood that any one VM failure/loss will result in mutlitple services lost. There are a several good points made my new blogging buddy, Miguel. Number one, you don’t include in your design features for the sake of features. This may seem obvious, but perhaps for a passionate (maybe overzealous!) VMware Architect, implementing features on which on-site staff are not proficient or can’t manage is not a benefit. As Miguel shares in this “palm-to-face” anecdote, such features in the hands of untrained staff can have the opposite effect for which they’re designed. So take into account the staff’s abilities before including advanced features in your design. Number two, communication is key in any environment. Communicating to the customer the gravity of the decisions they make in regards to what’s included in the design and certainly sharing planned maintenance times with all stakeholders. A communication strategy and change control process are key to making this work. Number three, as Miguel shared with me, if an admin is looking at his virtual infrastructure like a hog looks at a wristwatch, well, things are pretty bad. And finally, always remember: VMware’s easy. I had a long-term project at a customer site where I was to analyze, design, and architect a solution based on the equipment, environment, and requirements. Before I rolled in to the customer site as the new VMware SME, there had been a recommendation by a junior and recent VCP to implement distributed switching, linked vCenters and a few other feature sets of VMware and NetApp. There was not any experience with distributed switching by the on-site staff and their exposure to VMware was minimal, although many thought themselves as experts after a few weeks with the product. I kept hearing the comment that VMware was easy. I recommended a hybrid solution with the MC using standard switching, and VM network\storage on distributed switching as a compromise to a fully distributed solution. They decided against this even after I presented them with the advantages. While I’m traveling, I carry a beefy laptop as a mobile test lab. I fired it up recently after several weeks of no lab work and to my chagrin, looked up and saw the dreaded purple screen of death for the first time. I saw this as a good opportunity to research this particular PSoD and post my findings. So far, our Physical-to-Virtual migrations of Exchange 2003 on x86 Server 2003 Enterprise boxes have gone mostly smoothly – until this evening, that is. In the past, a failure soon after the P2V process started was resolved with a reboot or by disabling the TCP Offload Engine on the Broadcom NICs (this was easily accomplished with the cmd.exe command netsh int ip set chimney DISABLED). This evening’s P2Vs were a bit more challenging.